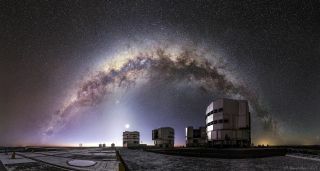 The entire arc of the Milky Way can be seen in the southern sky in this view from the European Southern Observatory's Very Large Telescope at the Paranal Observatory in Chile's Atacama Desert. Miguel Claro is a professional photographer, author and science communicator based in Lisbon, Portugal, who creates spectacular images of the night sky. As a European Southern Observatory photo ambassador, a member of The World At Night and the official astrophotographer of the Dark Sky Alqueva Reserve, he specializes in astronomical skyscapes that connect Earth and the night sky. Join Miguel here as he takes us through his photograph "The Arc of Milky Way in the Twilight with the Moon and Zodiacal Light above VLT." The entire arc of the Milky Way galaxy extends across the southern sky in this lovely panoramic view from the European Southern Observatory's Very Large Telescope (VLT) in northern Chile. This image was captured at the end of nautical twilight, or about an hour after sunset. During nautical twilight, darkening skies render features along the horizon nearly indistinguishable, and starlight begins to outshine the diffused, residual sunlight as it scatters in the atmosphere and fades into the western horizon. The bright object glowing in the left corner of the Milky Way's arc and to the left of the small tower is not a star, but the great globular cluster Omega Centauri. A little farther to the left and inside the structure of the arc are the bright stars of Alpha Centauri and Beta Centauri. In the middle of the image, the strong light of crescent moon illuminates the Antu ("Sun") telescope, one of the four main optical telescopes in the VLT array. Above the moon, we can see the planet Saturn, the orange star Antares in the constellation of Scorpius, and the dark streaks of the Rho Ophiuchi cloud complex. Filled with opaque interstellar dust, these dark lanes appear to connect this nebula to the arc of the Milky Way, which stretches more than 200 degrees across the night sky. In the background of this same region, a faint white light called the zodiacal light illuminates the atmosphere. In the foreground at right, we can see the Yepun ("Evening Star") telescope reflecting a silver color as the moonlight reflects on its metallic surface. In the extreme right edge of the image, the Andromeda galaxy is visible as an elongated diffuse dot.